It has become a tradition to post that each portion of the new information about the upcoming action-RPG, entitled Dragon Age: Inquisition, in Twitter-account of the game, and today’s news isn’t an exception. Yesterday, two fresh Dragon Age: Inquisition screenshots, which demonstrate, as you may already guessed, the new location, appeared on the official project’s page in the above mentioned social network. This territory is called The Western Approach and, according to the images, isn’t hospitable at all. The developers describe it as a place “arid, corrupt, and dangerous”. And it really looks almost desolate and full of different menaces and hazards, which await you on each corner, but, surely, it’s up to you to decide. 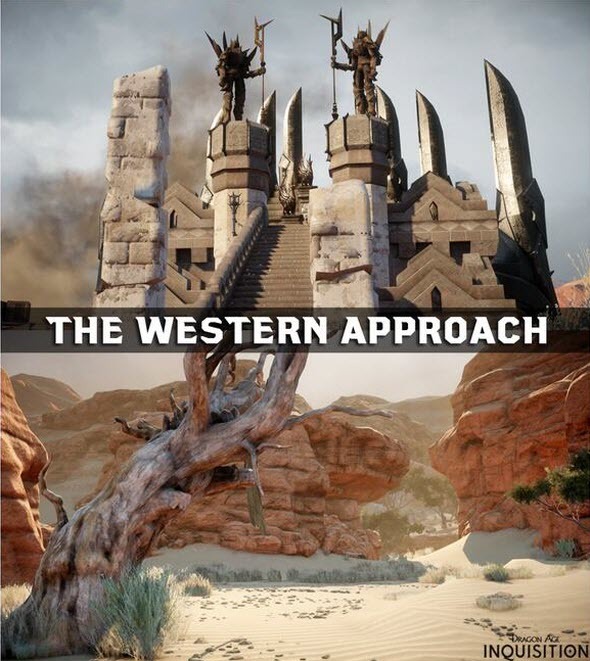 So we advise you do not waste the time and look at new Dragon Age: Inquisition screenshots, and don’t forget to write your opinion about this location in the comments below. We would also like to remind you that earlier Bioware company presented a couple of fresh territories - Emerald Graves, Emprise du Lion and The Exalted Plains of Dales, - the pictures of which you may find in our FB community. The game itself will be launched this autumn on the current and next-gen consoles and PC.